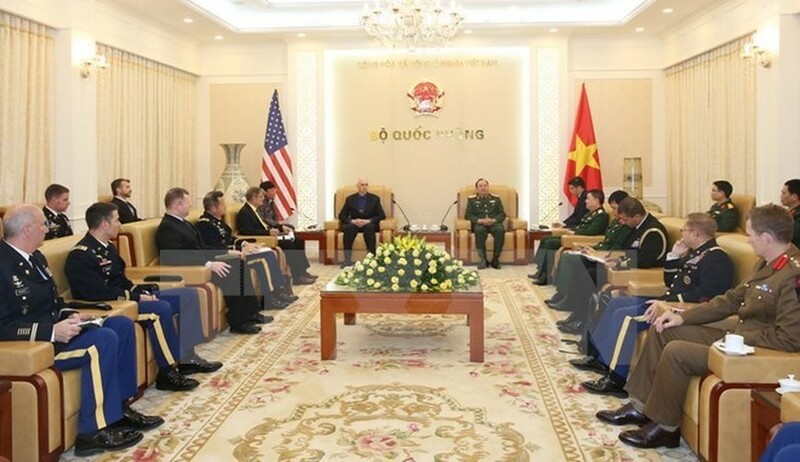 Deputy Chief of the General Staff of the Vietnam People’s Army Pham Ngoc Minh received a delegation of the US Army Command and General Staff College in Hanoi on February 27. Sen. Lt. Gen. Minh described the US delegation’s working visit as a contribution to enhancing the mutual trust and understanding between the two countries’ armies and people. Vietnam and the US have made strides in defence relations, especially in delegation exchange, military medicine cooperation, war consequences settlement, and search and rescue, he noted. He also fielded the guests’ questions about the defence diplomatic policy of Vietnam. Prof. William J. Gregor from the college’s School of Advanced Military Studies said the information his delegation received at the meeting is useful to them to get a better understanding of the land, people and army of Vietnam, thus helping to boost defence cooperation between the two countries.